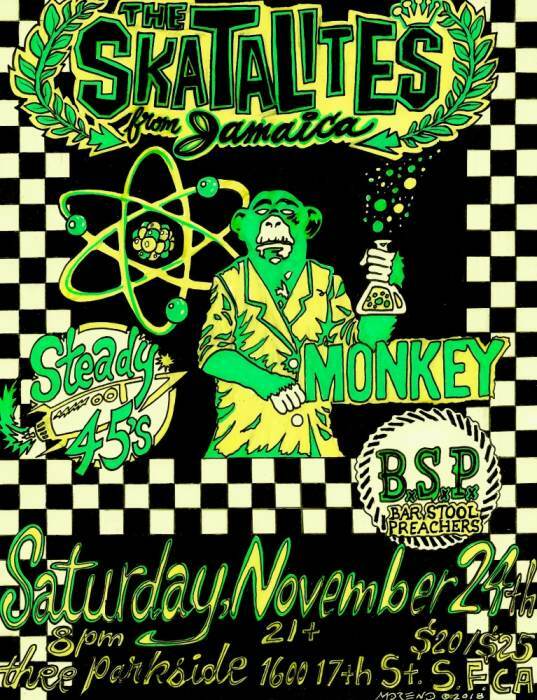 The Ska-talites began performing in Jamaica in May 1964. The group was so hot that their first rehearsal became a show. So many people had lined up outside the venue, they decided to just charge admission and let everybody in! They were the top musicians on the island at the time, having come together after playing in different bands and on various recording sessions. These records were made to be played at the many competing sound systems around the island. The band became legendary, backing all the developing artists of the day, such as Toots and The Maytals, Prince Buster and “The Wailing Wailers” featuring Bob Marley, Peter Tosh and Bunny Wailer. These groups were all recording on the new beat called ska, which had an infectious rhythm that was catching on like wildfire. Eventually, the beat slowed down into rocksteady, and then reggae. This wildfire spread unstoppably around the world, developing into a huge musical tree with many stylistic branches, including lovers rock, dub, dancehall/ ragga, ska-punk,, and others. Hugely popular groups, like The Police, The Clash, The Specials, The English Beat, Sublime and No Doubt, all have their roots firmly planted in the music of The Skatalites. Rocksteady and traditional ska music from a 7-piece band of hooligans. 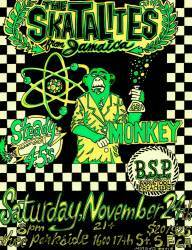 Monkey is a 5 piece high-energy organ driven, Ska/Reggae group from the SF Bay Area. Intense live shows and rock-steady rhythms not only get the crowds dancing, it has won the band several awards, including the prestigious California Music Award (BAMMIE)!